The perfect gift idea for newlywed couple, Gift for married couples. Fun present for Valentine's day / Anniversary. Mr. and Mrs. Matching Couples Gift Set. His and Hers Premium quality hoodie. 50% cotton/50% polyester, 7.8 oz thick fabric weight. Relaxed, comfortable classic fit, hooded top, ribbed sleeve cuffs and bottom hem. Machine washable. Guaranteed to keep you warm and comfortable this winter! it is sure to be a hit, whether you're buying it as a gift for somebody special or wearing it yourself. Available in a wide variety of sizes and colors - choose the size and color options from the drop-down list. OUTSTANDING FABRIC QUALITY! 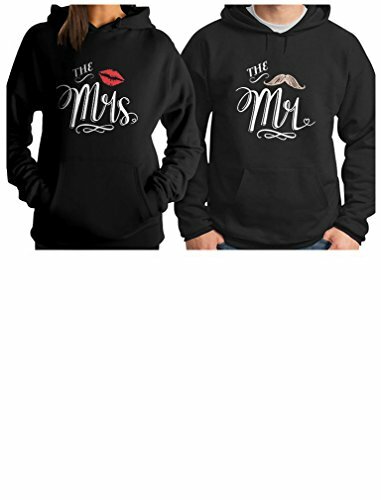 Mr and Mrs Matching COZY Hooded Tops. The perfect gift for couples. Mr & Mrs matching set. Great gift for Valentine's Day, Wedding gifts, Anniversary gifts, Mom & Dad gifts, His & Hers gifts! If you have any questions about this product by TeeStars, contact us by completing and submitting the form below. If you are looking for a specif part number, please include it with your message.